Birding quietly on the shore of Lake Erie, I saw a van pull up. The birders inside pulled out their optics and pointed them in my direction. Eek! I've had that happen before and it freaks me out. I mean, I'll check to see if I recognize someone, but I don't train my scope and binoculars on a person for more than a few seconds. They just kept looking and looking. I decided to move toward them, or at least out of the direct field of view, and was relieved to learn that they were looking at something else that, thanks to the docks, was below my field of view. 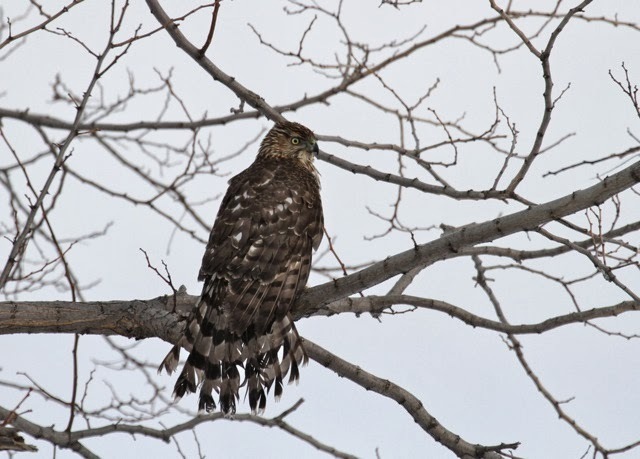 I drove over and saw a large immature female Cooper's hawk flap up from the water's edge. She was disheveled and soaking wet. Which is a scary thing to be when it's 7 degrees, with a stiff north wind. You can freeze right to your perch if you're not careful. You have to keep moving. I couldn't imagine that she had been bathing. 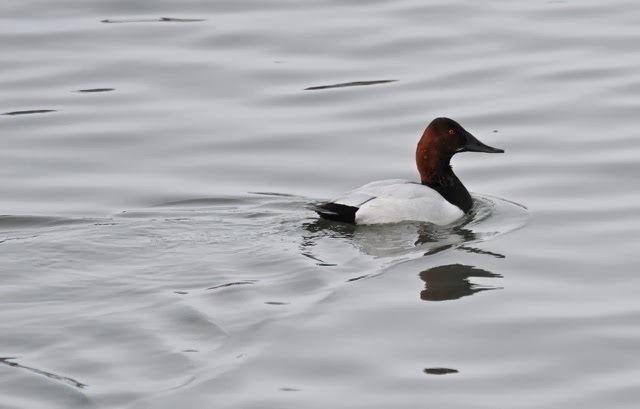 And sure enough the birders pointed me to the scene of an epic struggle, in which she had caught and held a greater scaup underwater until it drowned. Holy cow. They said she got all wet because she kept trying to lift it out of the water. But it was too heavy for her and she eventually gave it up. The hawk shook her plumage and left in a flurry of droplets. I felt bad for her. I hoped she'd get dry quickly. I picked the adult drake up and was surprised at how heavy and dense it was for its size. And yet...I felt through the thick breast feathers and down to its keel, and was not surprised to find it severely emaciated, the breast muscles shrunken away from the bladelike keel bone. 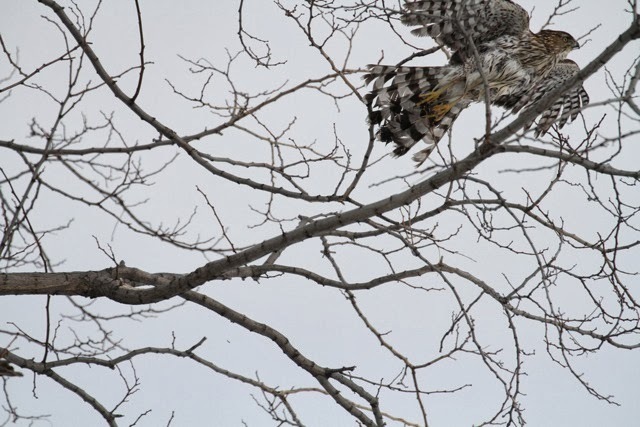 I doubt that a Cooper's hawk could subdue a greater scaup in good condition. 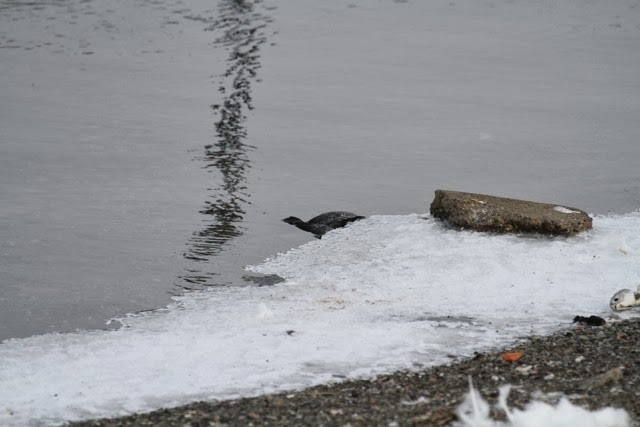 I laid the scaup out on a rock near where it had died, hoping that the hawk could return and dine on it there. It was a meal hard-won, and I hated to see the bird go hungry. 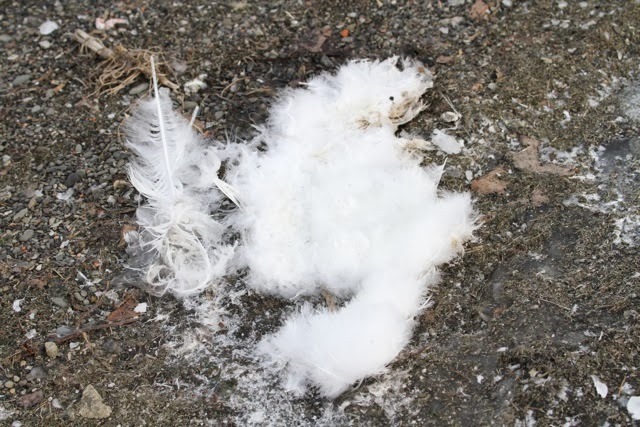 I looked at the asphalt at the lake's edge and was stunned to see patch after patch of feathers, pulled from the breasts of resting waterfowl who had gotten out of the water, laid down and frozen to the pavement. What a drag to have your coat torn off you in this weather, to have your breast exposed to the freezing water! No wonder there were so many birds dying all around. 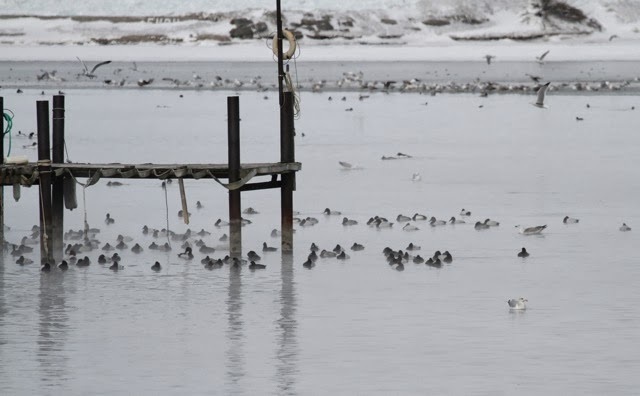 It occurred to me that if I lived anywhere near Dunkirk Harbor, I would probably have a garage and basement full of baby wading pools and compromised ducks, geese and gulls. As I stood on the shore, I could feel the weird energy of all the birds' combined travail and suffering. It set up a fluttering in my heart, a sympathetic vibration, that imbued the entire experience with a tinge of sadness. I wanted to help them all, but I couldn't. This is a place with its own energy, one of combined joy and loss--a clanging fracas of gulls and ducks, studded with elegiac signs of death and loss. When I'm in a place like this, I sometimes wish I could turn down the side of me that is so keenly aware of suffering. But if I could, I wouldn't be me anymore. 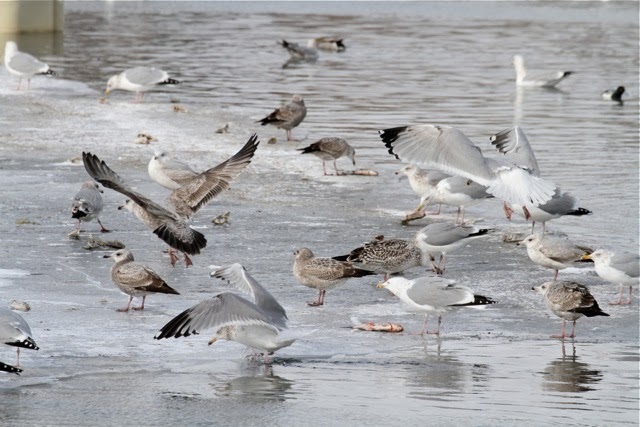 Any time you get a huge concentration of birds together (more than 3,000 gulls in a mixed flock of herring, great black-backed and ring-billed, with a handful of glaucous and Iceland gulls sprinkled in), you get some cool behavior to watch. The longer you stay, the more likely you are to see something interesting. With these highly intelligent, opportunistic birds, just noting how they forage and what they find to eat is fascinating. 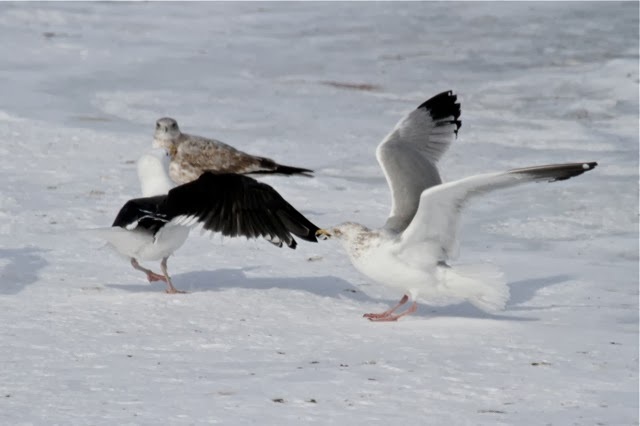 Gulls can live into their late 20's; a herring gull has hit 30, and they pick up a whole lot of smarts along the way. For a fascinating look at bird longevity, see the lists at Longevity Records. I'm a bit disappointed that despite submitting data, my 17 year old captive Orchard Oriole and Savannah Sparrow, rest their souls, haven't yet made the list. Maybe they don't believe me. Most of the birds were quietly occupied, feeding on dead shad. It seemed that anyone who wanted a fish could find one, and there was little squabbling over the prizes. 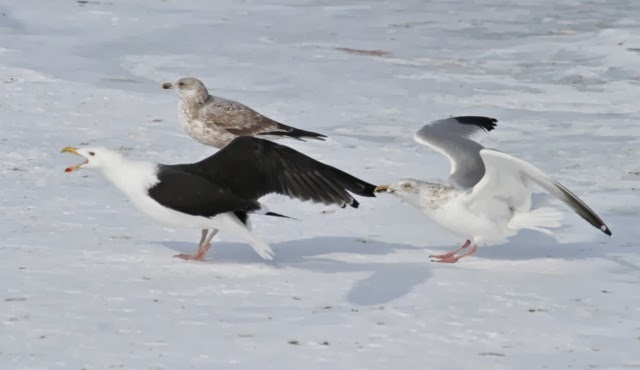 and I saw to my amazement an adult herring gull had grabbed the wingtip of a much larger great black-backed gull. 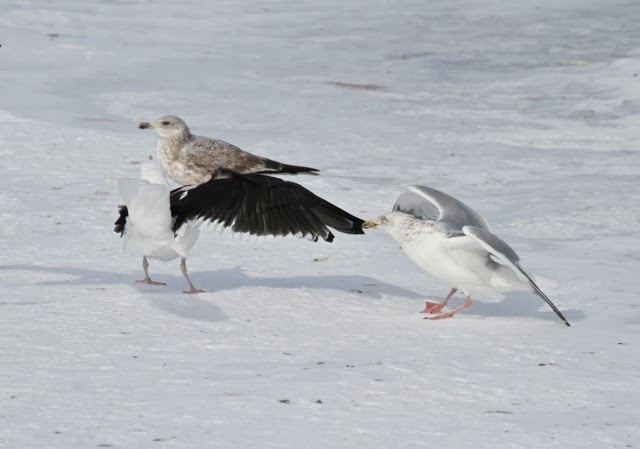 Instead of hammering the herring gull on the head, the great black-backed panicked and tried to get away. Power in intimidation. It reminded me of a little mugger, holding up a knife and subduing a much larger person just with chutzpah. Just because he can. The kind of scratch-your-head moment that I love so much. The great black backed lost all dignity and started to squawk in distress. It finally wrenched its feather free from the ornery herring gull, and flew off to find another place to hang out. A bully-free zone. It was kind of refreshing to see the Dread Pirate of the High Seas, capable of killing diving ducks and shorebirds with a single blow to the head, bested by a smaller bird. I can't think that this was anything but play on the part of the herring gull. Risky play, but it's something to do when your crop is full of shad and ain't nothin' else goin' on. Pick a little fight with somebody bigger than you are. Birds...so intelligent, so mischievous, such fun to be around. In a tough winter, the cool big gulls from the Far North come down to our ever-so-slightly warmer climes to find open water and food. 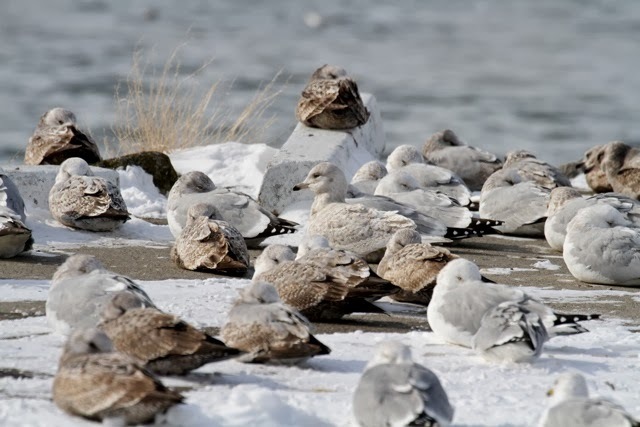 King of them all is the hulking glaucous gull, shown here absolutely dwarfing herring and ring-billed gulls. They can be larger than the great black-backed, and they have a distinctive look, with a big puffy head and, by proportion, a small-looking dark eye. 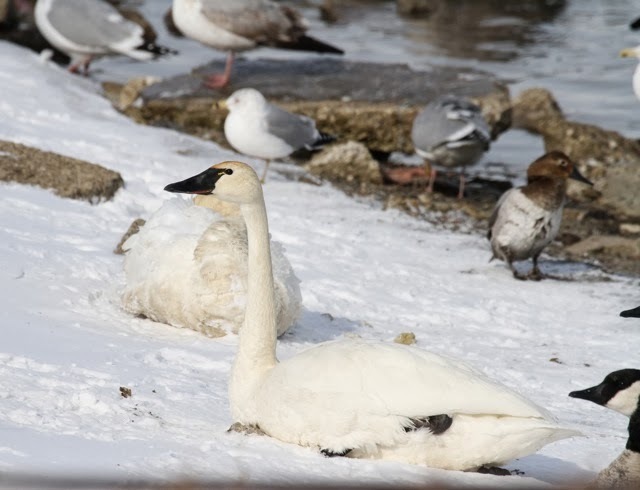 They also have the grace to be nearly all white, even down to the primary flight feathers. 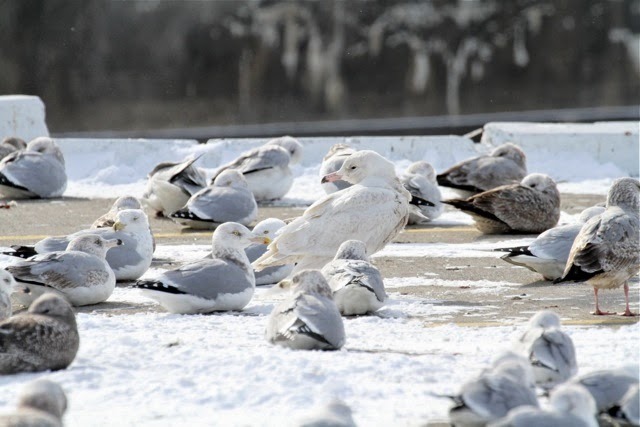 So it's not tough to pick a glaucous gull, like this immature bird, out of a flock of sleeping herring and ring-billed gulls. 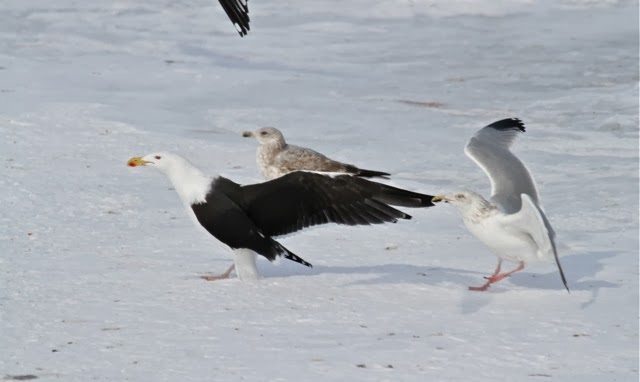 Herring gulls have the red bill spot, while ring-bills have a black ring around the bill tip. The chocolatey gulls in this shot are young herrings. By this time of winter, young ring-bills, like the bird on the left edge of the photo, look much like adults, with a lot of gray mantle feathers showing. That's because a ring-bill is a two-year gull, while the herring takes four years to attain adult plumage. 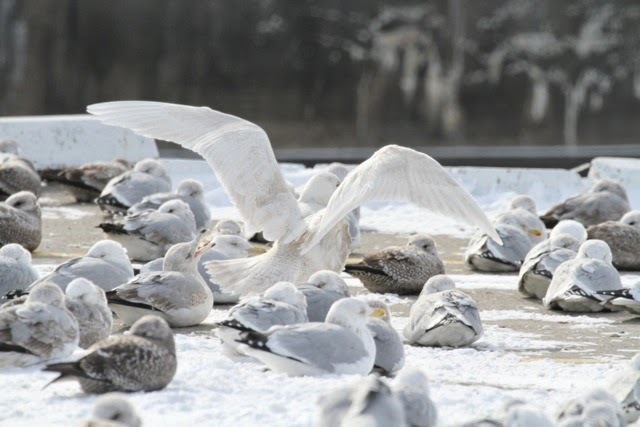 Every once in awhile, the glaucous gull would spread its wings and hop a few feet, then settle down again. Wow. A few dozen birds over, an immature Iceland gull rested. It's dead center, with the black bill tip and the white primaries. 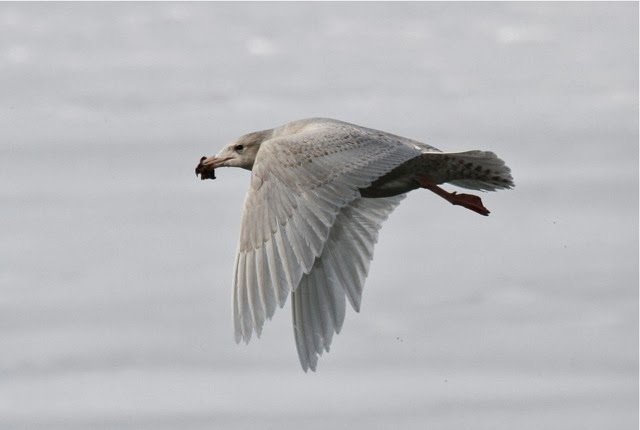 Icelands are smaller than glaucous gulls, but their plumage is similar. All around, rafts of diving ducks floated. 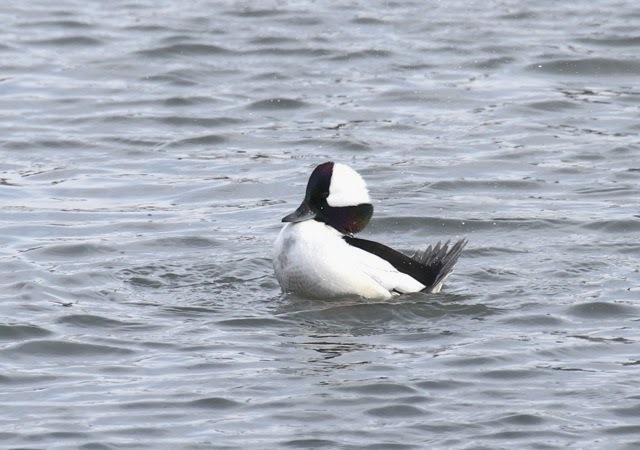 Two beautiful drake white-winged scoters joined the greater scaup and common goldeneyes. I love the white eye crescent (actually feathers behind the eye, whose iris is also white). At a distance, it looks like they're winking at you. 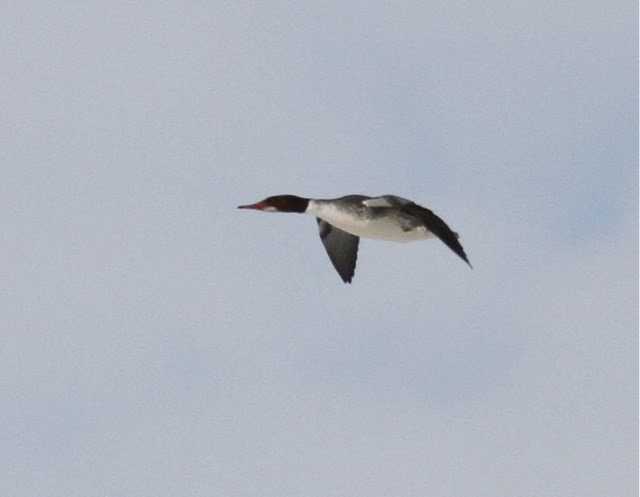 A female common merganser arrows by. 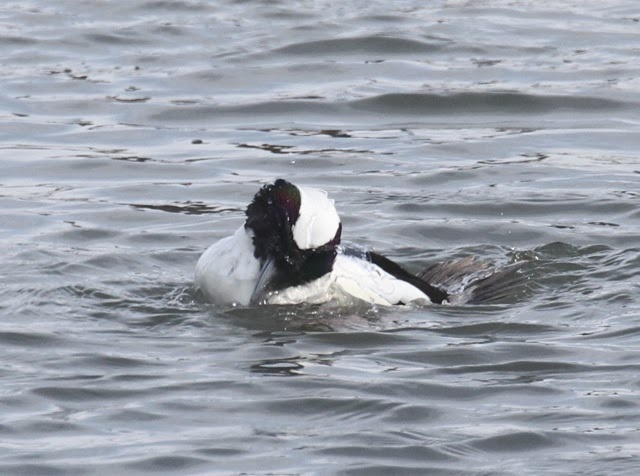 The clean white patch beneath her chin and the spotless breast, contrasting with a clear-cut sienna head, differentiates her from a red-breasted merganser. There were easily 1,000 common mergs in a single raft out there. Whoo. 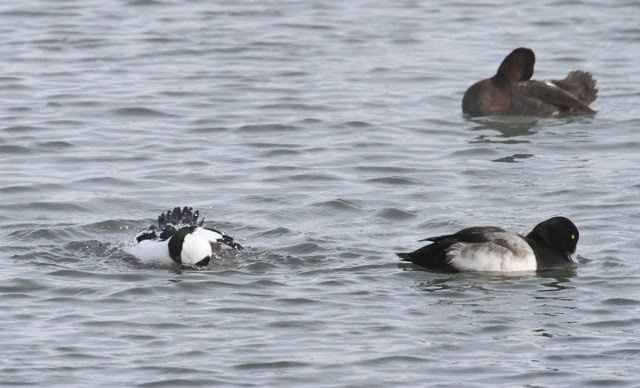 I lucked into four long-tailed ducks in the two days I birded Dunkirk Harbor. This is as close as I could get. Two have hauled out onto the ice at the rear right of the photo. You can see their dark round cheek spots. 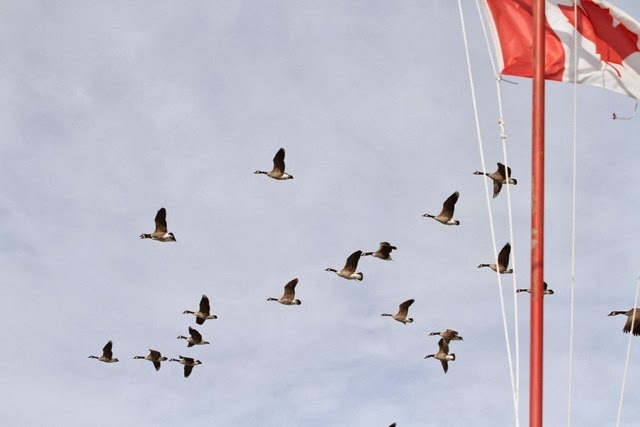 I absolutely love combing through flocks of waterfowl, looking for the new and different. I mentioned the abundance of death in my first post. When you get this many birds crowded into one spot, some of them are going to die. Disease and starvation take their toll. Some haul out and freeze right to the ice. It must be an awful way to go. 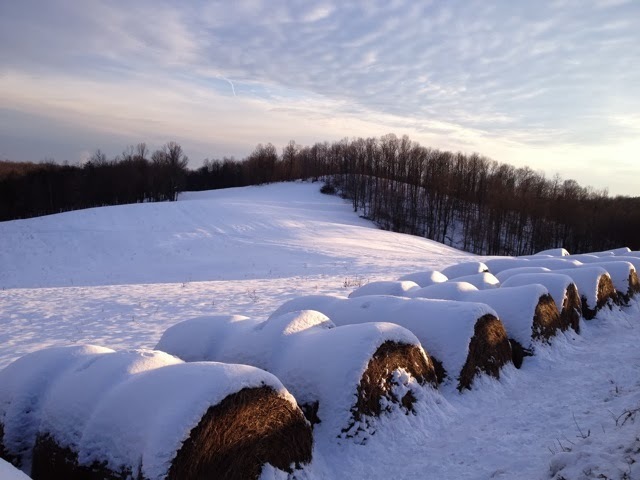 When the temperatures hover around zero F for weeks at a time, somebody's going to die. 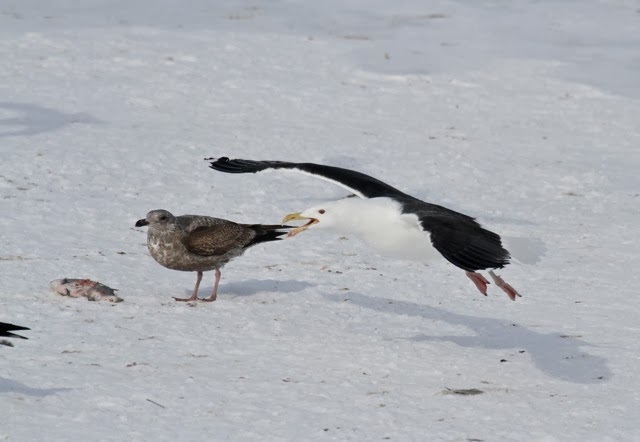 I have heard recently that great black-backed gulls around Cape Cod have been observed this winter, holding diving ducks underwater until they drown, then eating them. This is probably slightly outside the normal GBBG foraging behavior, especially at the frequency with which it's being seen. But cultural trends travel like wildfire in birds. As a bird rehabilitator, I know that if you want to get a bird to do something, put its cage next to that of a bird who knows how to do it. Birds learn largely by copying what their neighbors are doing. This is why, in late summer, I'll see young scarlet tanagers, common yellowthroats and orioles (insectivores for the most part) coming in to investigate seed feeders, wondering if there's anything there for them. Everybody else seems to be finding food there. Let's give it a try. 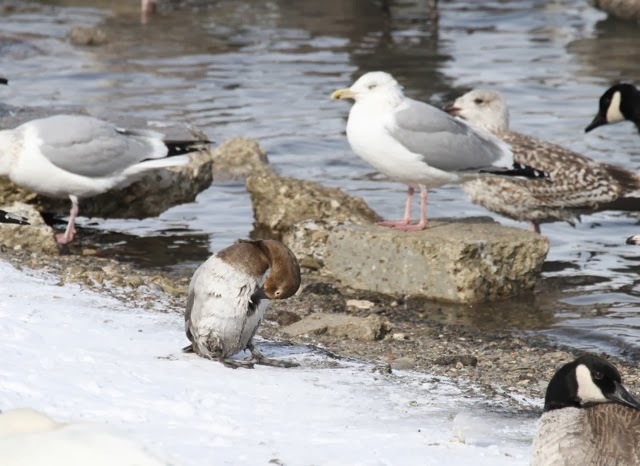 With the number of birds freezing to the ice or dying from starvation here, I doubt this young great black-backed (black tail) or glaucous gull (mocha-white overall) had to drown the red-breasted merganser to get a meal. A herring gull picks at a dead shad in the next booth at the Macabre Cafe. 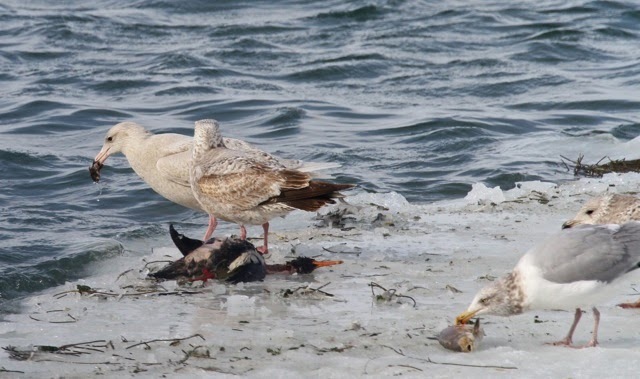 The glaucous gull dipped its merganser breast filet repeatedly in harbor water, then flew off with its prize. 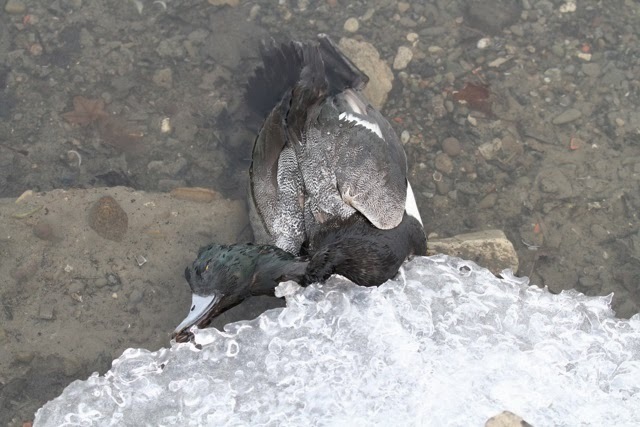 Despite the death of the merganser, it made me feel good to see everybody eating on such a frigid day. I dug into a jar of almonds and thought about how nice it was to be in a heated metal capsule, swaddled in goosedown, eating almonds instead of frozen merganser. I remain in the thrall of birds, who have no such place to retreat, and routinely survive conditions that would kill me in a matter of minutes. I spent a couple of days recently in New York, one of my objectives being to do some winter birding. Not surprisingly, Lake Erie was frozen solid. It's a shallow lake, and it freezes pretty quickly. In a winter like this, everything seems to have frozen over. Me included. Ice several feet thick puts an unequivocal damper on lakeshore birding. There was nothing around for miles and miles. A quick search of eBird, though, revealed that there were some interesting things happening around Dunkirk Harbor. Only a warm-water outlet could explain that. I made my way along the jumbled frozen lakefront toward three tall stacks belching smoke and steam. That was where the birds would be. And sure enough, a coal-fired power plant was warming the water sufficiently to open part of it to fish, ducks, and gulls. Local birders I spoke with said that the plant was operating at only a fraction of capacity, and that there's normally much more open water than I saw. Never having been here, I was all agog. 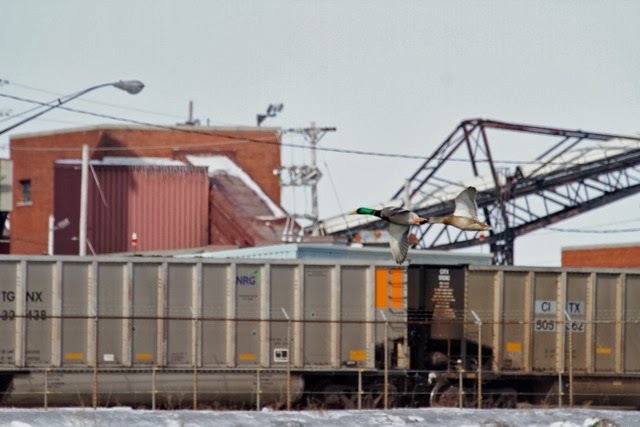 A pair of mallards flies past containers in the harbor, the male's green head glowing Kryptonite. 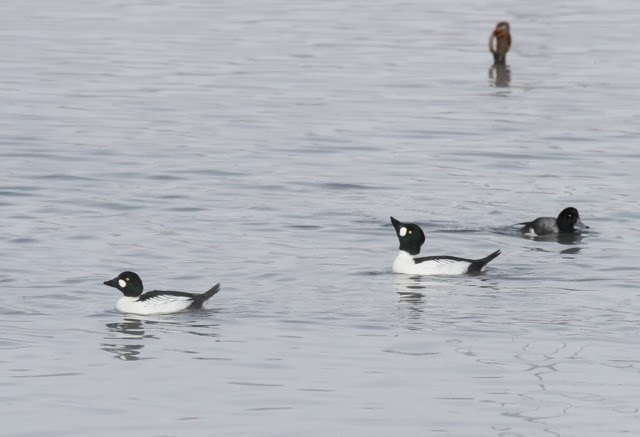 Common goldeneye drakes were feeling frisky despite the extreme cold (it was about 7 degrees, with a wind chill of I don't want to know). These two are performing head throws, which nicely spotlight their shining white cheek discs. 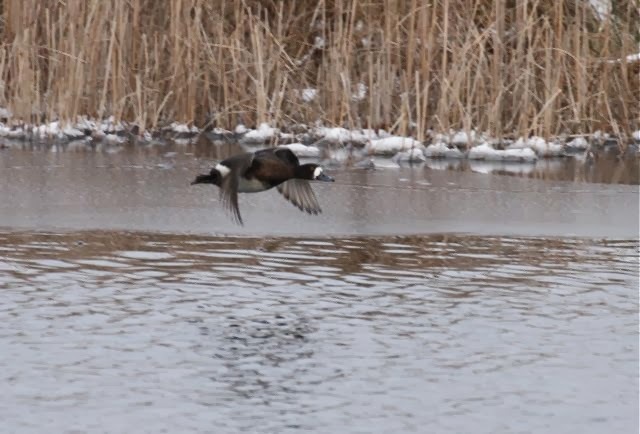 To the right is a drake greater scaup. 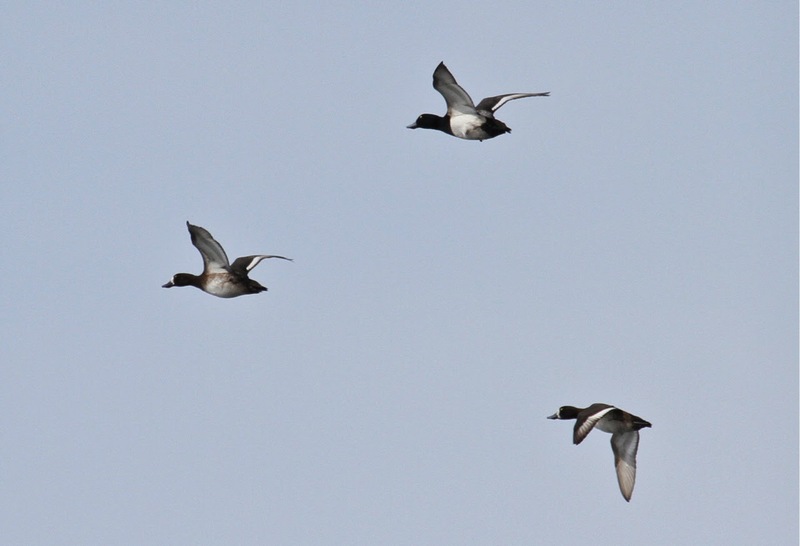 More greater scaup, a drake (top) and two hens. See how the white stripe goes down into the primary wing feathers, almost to the tip? 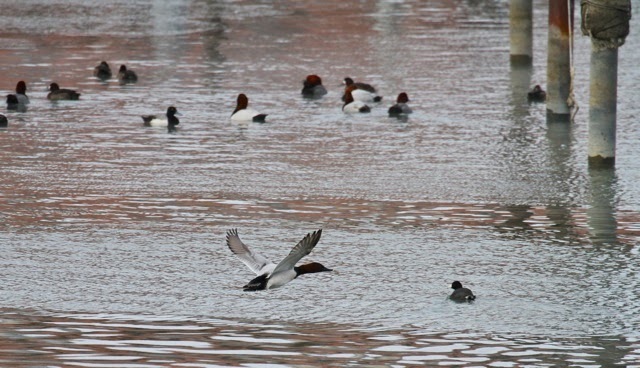 Lesser scaup have white only in the secondaries, so only the inner half of the wing has white. 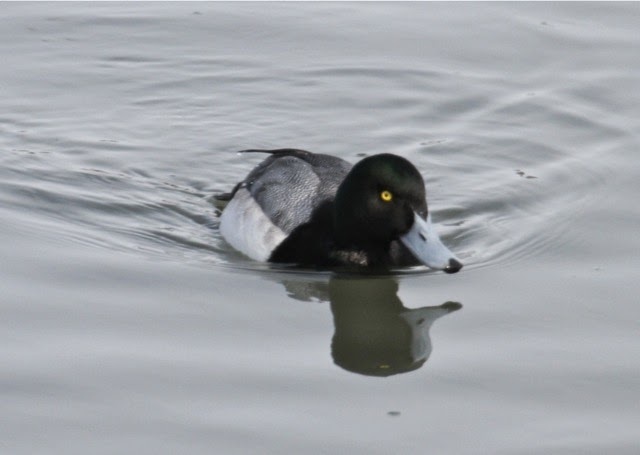 Here's a hen lesser scaup from last winter's Virginia trip. Half a wing stripe. It's obvious in flight, and it's the easiest way to tell them apart at a glance. 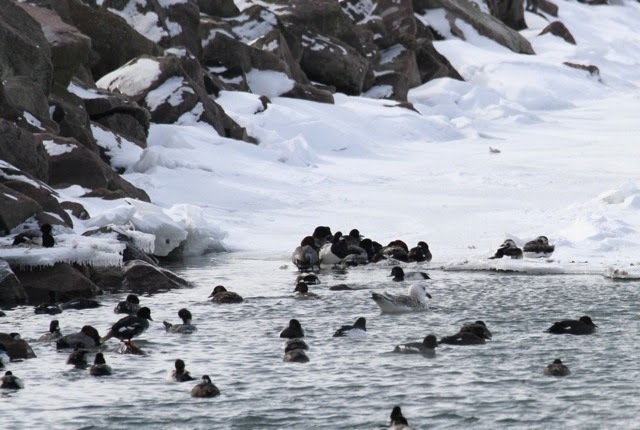 Here's a close view of a drake greater scaup (white-winged scoter in back!) The unequivocal green gloss on its smooth round head is a good field mark for this species. Lesser scaup are more delicate, with thinner, longer-looking necks. Instead of being smoothly rounded, their heads are peaked like Daffy Duck's, with a purple sheen. 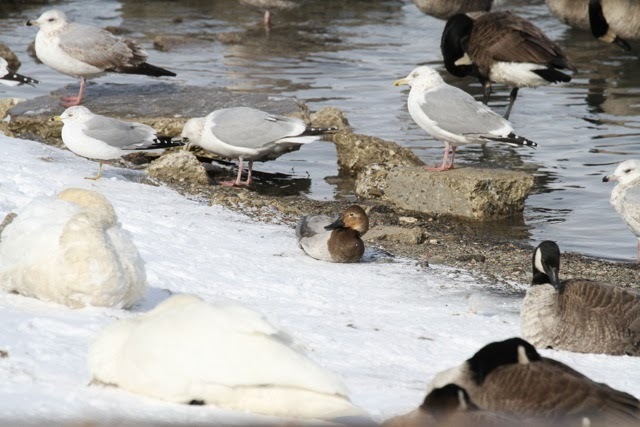 The sleeping brown duck in the foreground is a female greater scaup. Even closer. The greater scaup has a broad blue bill, with a large black "nail" on its tip. Lesser scaup's bill is narrower, and the nail is smaller. 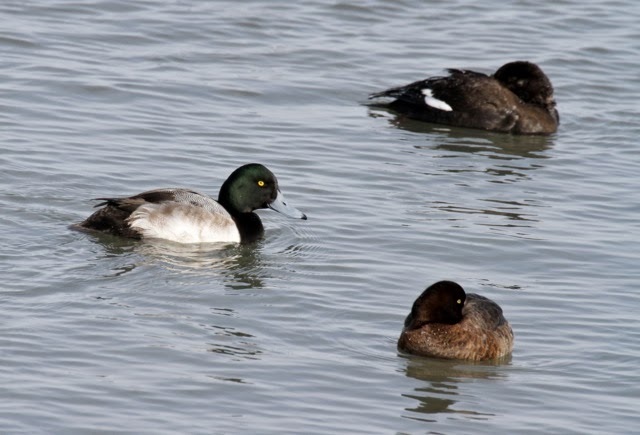 These may seem subjective, but when you've got a greater scaup, you just know it. 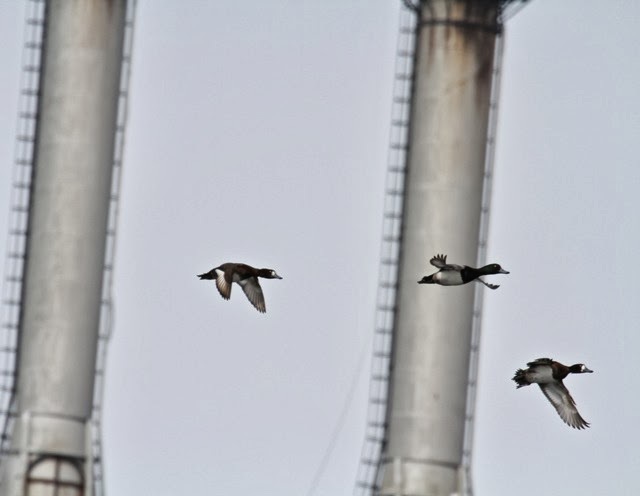 I love this image of greater scaup scudding by smokestacks. 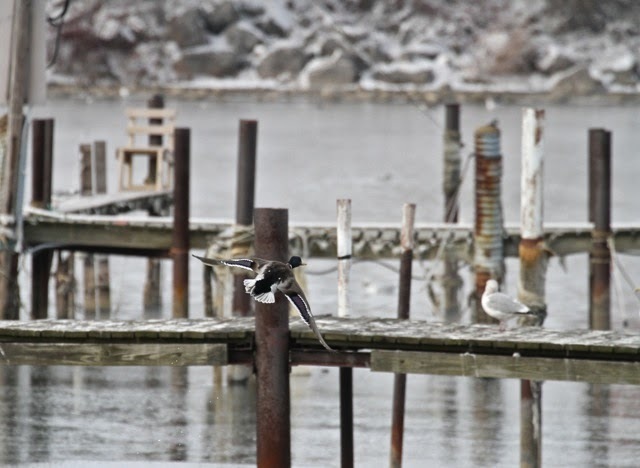 Dunkirk Harbor is a gritty place, and the burgeoning bird life is a sharp contrast to aging stacks, container ships, and the piles of coal around the old power plant. 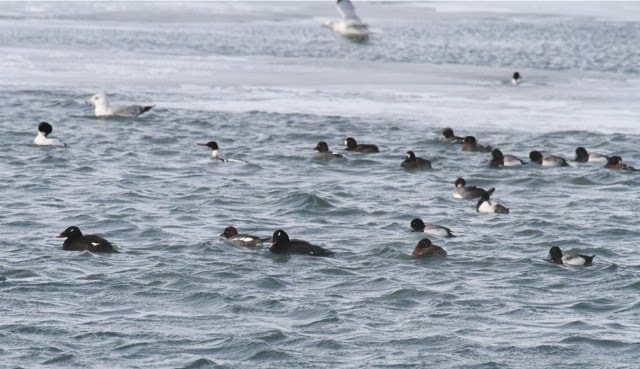 The scaup floated in vast rafts, along with thousands of common mergansers, mixed flocks of red-breasted and hooded mergansers, canvasback, redheads, goldeneye, bufflehead, and white-winged scoters. All around swirled thousands upon thousands of gulls, mostly herring and great black-backed. In the warmed waters of the harbor, the triangular dorsal fins of thousands of shad roiled and tossed. I'm not sure what was going on, but it was a shad event to be sure. And wherever thousands of any life form gather closely together, death follows. 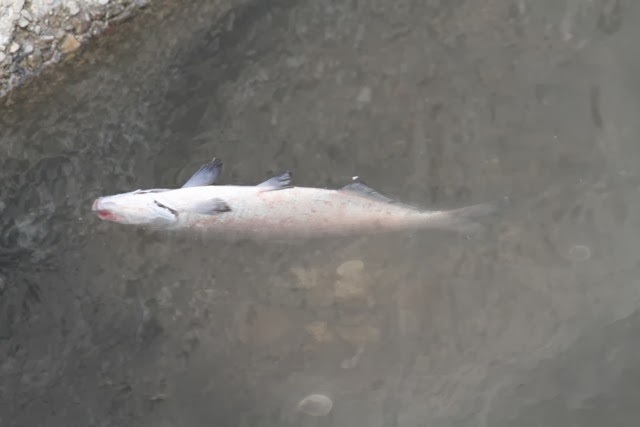 Dead shad floated all around. The gulls hauled them up onto the ice to carve them up. It was a macabre cafe, a gull cafeteria. 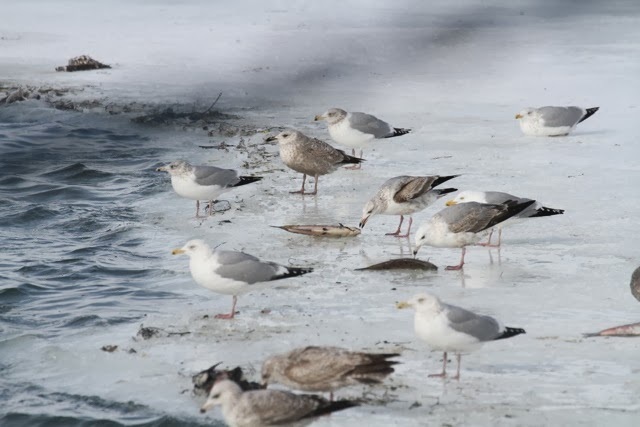 Nearly every bird had its own frozen fish to pick at. The gulls were doing very well here, reaping the abundance of death. 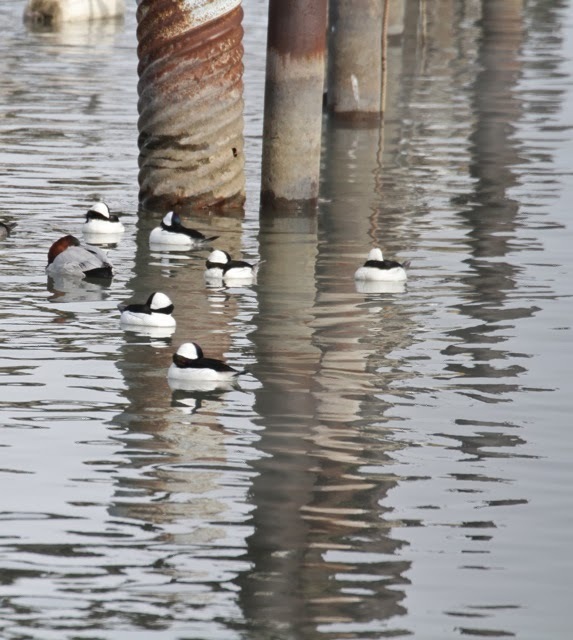 And under the piers, the buffleheads slept with Brother Canvasback*. *thanks to Hap in Minnesota and Bottomland Mud for chimping me! The start of last night's run. This is the only road we can use right now. 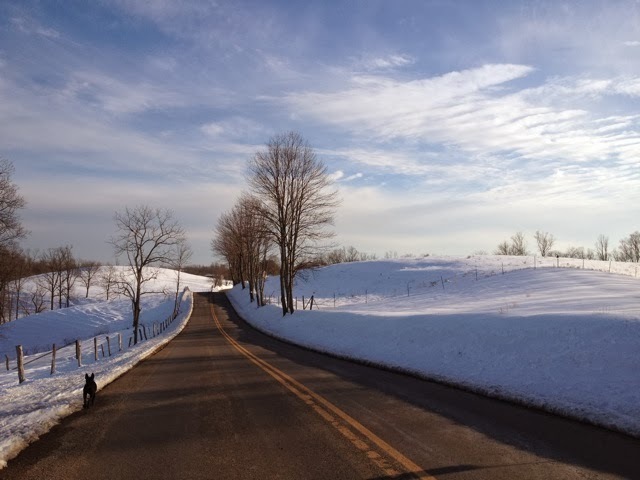 The main road is too busy and dangerous with snow taking up the shoulders, and the dirt roads like ours are still covered with ice. Talk about dangerous. I'm thankful for this road, every day. It's been my best friend this winter. I haven't juiced these photos up at all. They are what I saw. LOOK at the shadowblues!! My dear friend Hodge, who takes me around Cambridge when I'm there, showing me the most wonderful things, wrote a post on her blog, hereswhatiknowsofar, about the blue and the white. She hadn't yet seen "Mood Indigo," Tuesday's post. We're just in tune, that's all. We notice the same things. 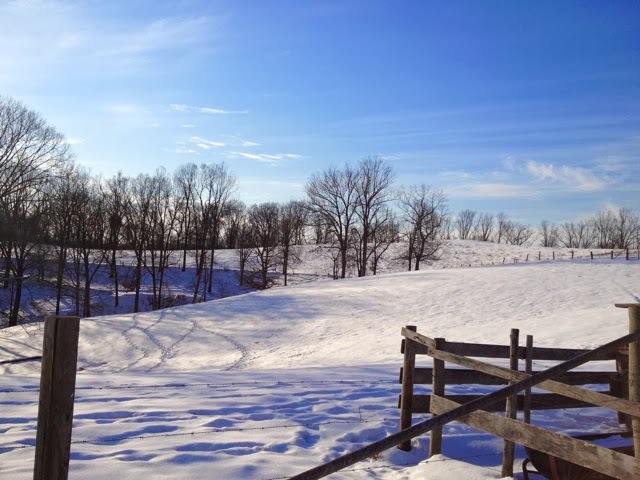 This synergy between dear friends who live ten hours apart by car inspired me to go look for some more blue and white on a beautiful 34-degree evening. Which was just Wednesday evening. 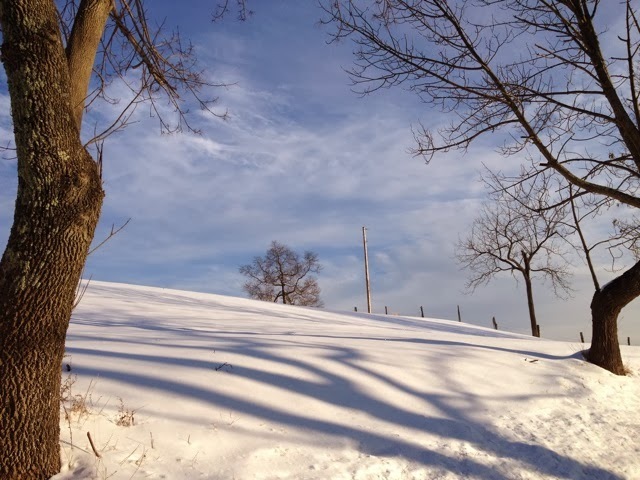 Blue sky, which you see a lot in Cambridge ourfaircity MA, is so very rare here in the mid Ohio Valley winter. I treasure it, for winter blues are singular blues. And these blues help me fight those blues. You know the ones. I took Phoebe and Chet along. Liam has an iffy throat and a sore neck and wanted to rest instead. It makes me so happy to run with my kids. I can't go out with them without wondering what I'll do when they leave. I wish I could stop wondering that. Dang it. 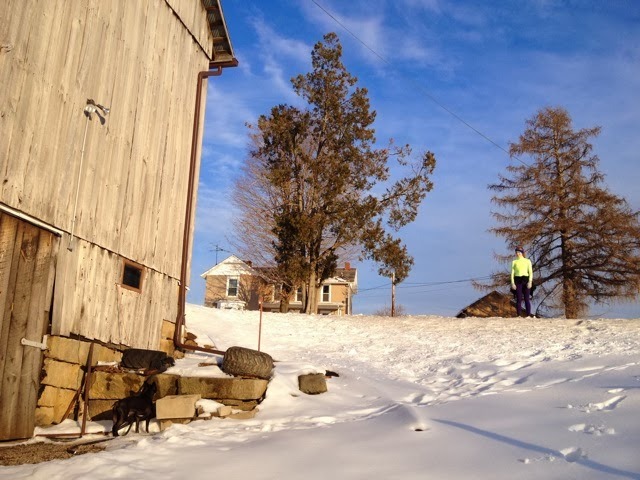 Running "with" my kids is a misnomer. Phoebe soon left me in the dust, or more properly the grit. Chet likes to run faster, so he went with her. She picked him up every time a car passed. We do that when the snow eats up our road shoulders. Sometimes I do it just to give him a kiss on the brisket. He waits to be picked up, gives a little lurch up into my arms to help. 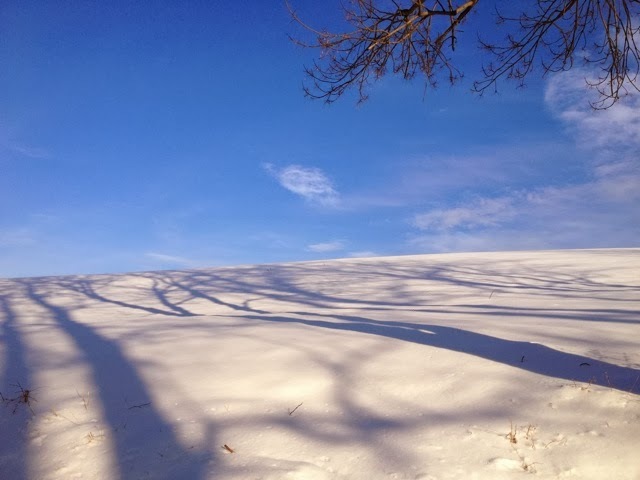 The more blue and white I saw, the farther behind I fell. "How do you get anything DONE?" Phoebe, my lithe greyhound, asked. 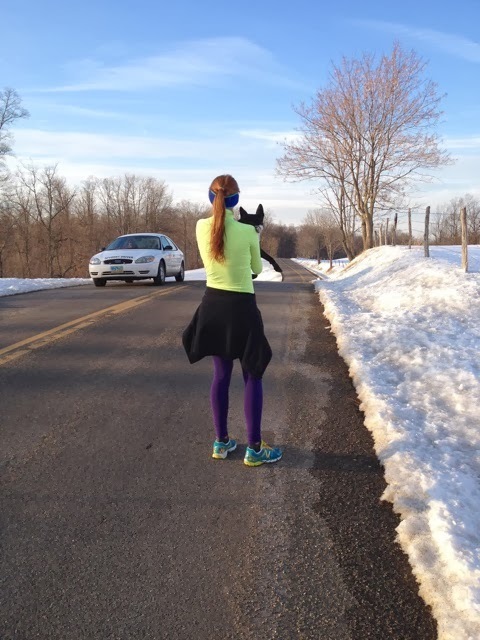 "Well, I consider my runs an aesthetic as well as a physical workout. Stopping is part of that." Which may be why I feel like so much donut batter poured into my clothes right now. I hate being sidelined, but I have to wait until I have asphalt to run on. It's been a long wait. I very much appreciate the fact that Phoebe doesn't make fun of me when I swoon over scenes like this. She does, too. But sometimes when Liam's along the temptation is too great and they laugh at me. That's OK. So many folks drive right by scenes like these without stopping to notice, that I figure I have to swoon hard enough for everybody. My favorite lane. Oh my gosh. 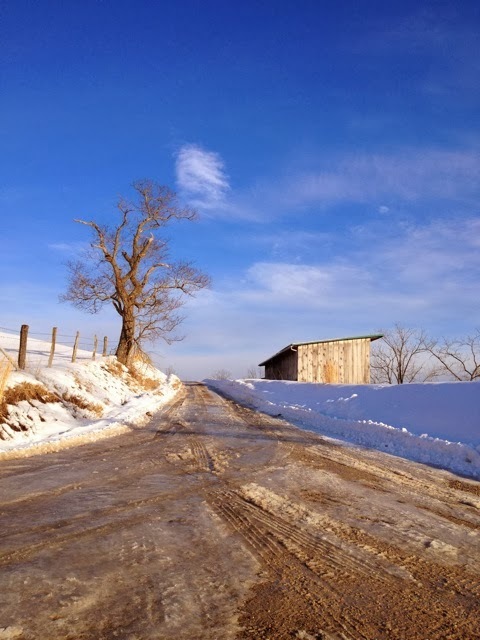 The corduroy mud, the color harmony with the tree and shed. I almost wept. Just leave me here, looking at all this, the blue, the white, the violet, the russet mud. That little combed cloudlet. 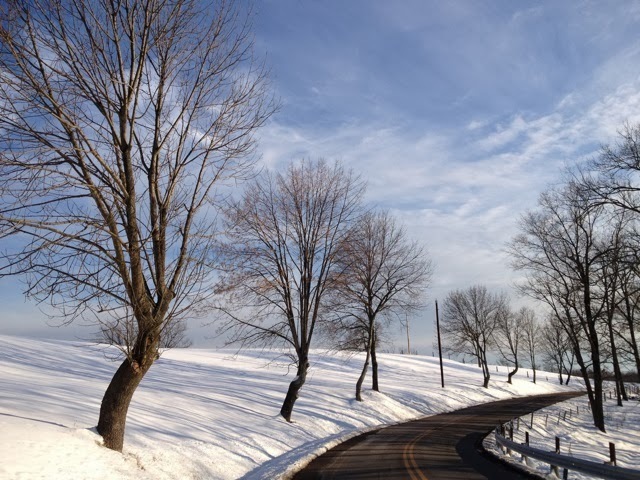 I always find these trees so graceful, the way they lean toward the road and then correct themselves. Oh, excuse me. I'm not supposed to occlude the road. Maybe it's because they've been trimmed back again and again over the years. Or maybe they just know. But they're all doing this little samba, and the snow points it up. I see my favorite sassafras peeking between them. She always looks like she's waving her wooden hands, hoping to be noticed. No worries, cold Sassy. I notice. But for years, I didn't notice her. 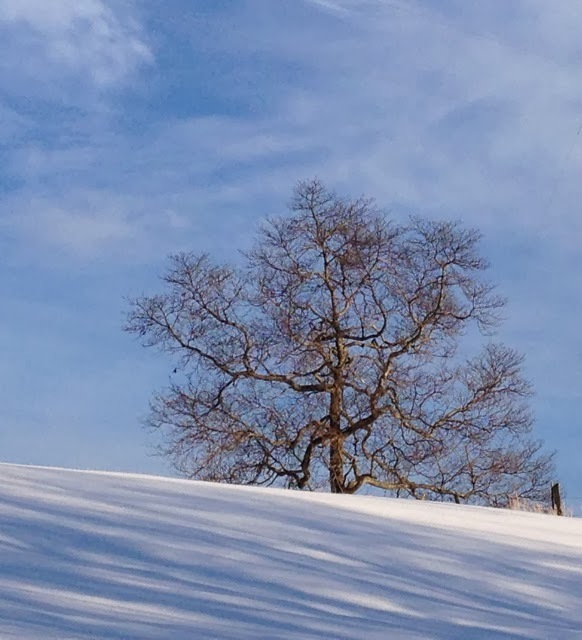 I've been tending a bluebird box just downslope from her for probably 18 years, and I never noticed this tree until this winter. And now she's a destination for me. I guess I had to come here a few dozen times before it sank in on me how beautiful she is. Before I wondered what she was and walked up the haymeadow to see. Before I started noticing how she shows in every kind of light and weather. 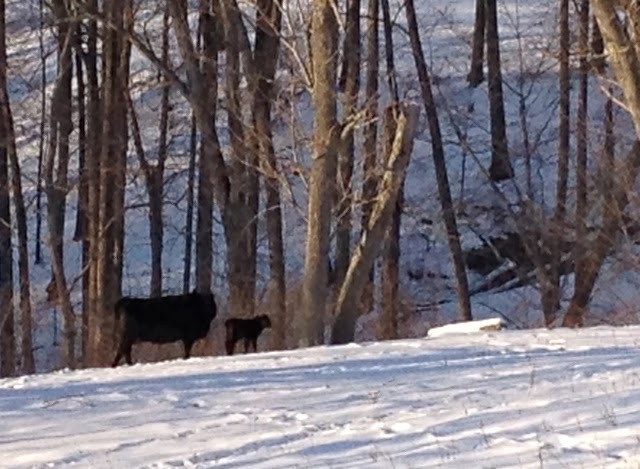 while Phoebe and I ogle the first calf of spring. So tiny. Hang in there, little Bully. It's supposed to warm up this week. 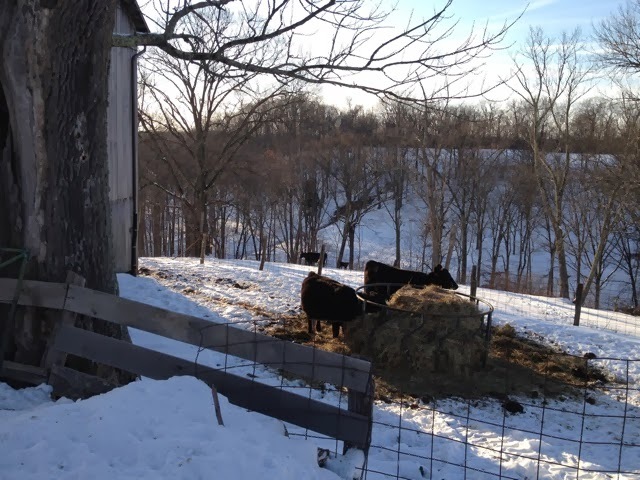 You can see the tiny calf in the background. We chug toward the car, parked a little more than a mile and a half away. The whole run is a little over 3 miles. And it all looks different on the way back, as the sun sinks. 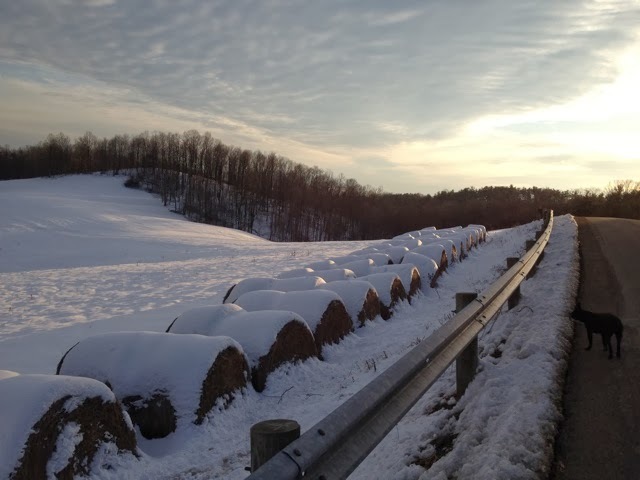 Swooning again at the pewter sky and the frosted wheat biscuits, the swoop of the guardrail, the delta of clouds, the plunge of the treeline. If there's anything better for one's compositional sense than iPhone photography, I've yet to find it. My compositional muscles are now much firmer than my thighs. I hope to correct that by summer. Blue on white, Delft days, the aesthetic workout. Hodge, this one's for you. A blue Valentine to my Cambridge muse.